Fashion and North East India found each other as though they were always meant to be. Folks from this region and their aesthetics have pretty much guided the fashion direction of the country. With colorful cultures and customs that foster the revival of trends from the past – that are constantly being recycled by the young trendsetters to ensure that design influences from this region stay in vogue for a long long time – and into the future. Fashion designer Reena Ahanthem from Manipur is an exemplary figure whose own style and work seek to revive and reinvent traditional wear from North East India – and manages to put keep them fashionable even in modern times. Born with a natural taste for fashion, she decides to pursue her passion by joining a fashion school, and later teaming up with a friend to start their fashion label “Deepankshi and Reena.” After running the label for almost a decade and dressing many celebrities with their creations, Reena is nor ready to move forward with her own individual brand “Ahanthem by Reena.” Here she talks about one of her first collections, where she incorporates the finesse of couture to the elegance of north-eastern traditional wear. Let’s have a chat with Reena Ahanthem to know more about her onward journey. 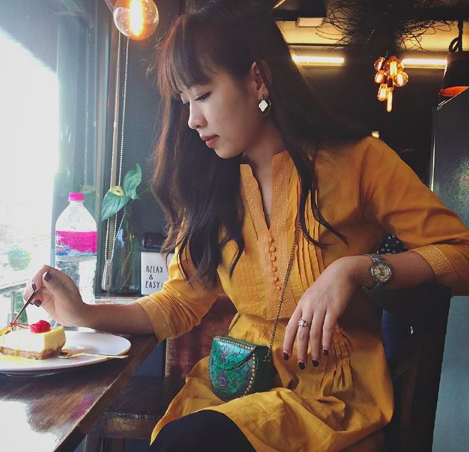 A chat with the bold and stylish Reena Ahanthem – a fashion designer from Manipur. 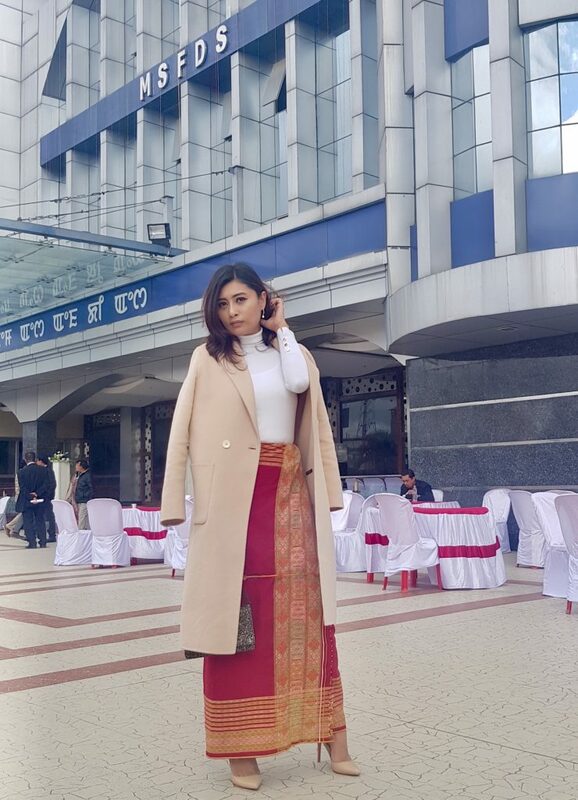 She talks about moving on to start her own fashion brand “Ahanthem by Reena”, her latest couture collection inspired by, and celebrating traditional North Eastern designs, her upcoming wedding and more. Hello Reena! Good to have you here, please introduce a little about yourself. Hi! My name is Reena Ahanthem from Manipur. I am a fashion designer and I’m in the process of building my own label “Ahanthem by Reena” and planning my wedding soon ☺️. I was living in Delhi but I have come back to Imphal, Manipur for a few months to spend time with my family before I move to London after the wedding. Hi Reena, tell us more about your journey so far. For 9 years, I was a part of the label “Deepankshi & Reena” but I left that to take on another role as a creative head for another label. Also for a year, I was the creative director of Abhinav Mishra, an Indian wear label which is very different from my forte. But I absolutely loved my experience of working with him and I learned a lot as well. Reena Ahanthem as the Creative Director for ‘Abhinav Mishra’. “Ahanthem by Reena” is a label inspired by north-east of India. For my first collection, I used Mizo (Mizoram) puan fabric. I will work with anything related to North East India – could be the fabrics, accessories or colors of different tribes.I was born to do this. I always knew I wanted to be a designer. No second thoughts about it. Reena with a model for her “Ahanthem by Reena” collection. How have your roots influenced your aesthetics and your work ethics in general? Dressing well runs in the family – whether my dad’s dapper style or my mother’s classy chic traditional style. Also, I grew up in the midst of siblings and family who are super trendy. 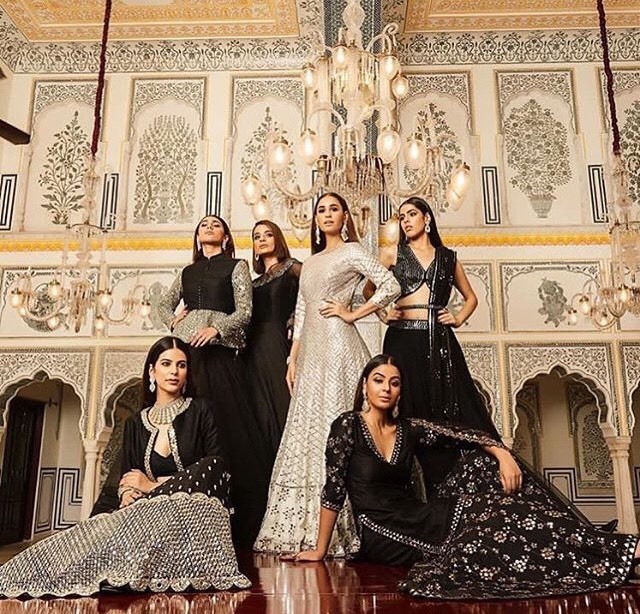 I have always been influenced by the trends being ‘showcased’ in the family – from the rock chic phase or the pop culture in the ’90s to the traditional wear during festivities to all sorts of style that has inspired the family over these years. My family is my real inspiration. What’s your work philosophy and where do you take inspiration from? Inspiration comes from anywhere.. a line from a book; A phee (cloth) from mother’s wardrobe; A song; A movie; A building; It’s everywhere. It’s anything that makes you feel beautiful even if for a moment.My work philosophy is to be honest and sincere with what you do. Work is the only thing that defines you. A model wearing “Ahanthem by Reena” using the Mizoram Puan fabric. Tell us about your first solo collection. Introducing our NE textile to our fashion industry is very exciting and challenging too. I have given my best shot on this collection. A model wearing “Ahanthem by Reena” gown made using the Mizoram Puan fabric. What do you hope people take away from your Creations? I want people to acknowledge how beautiful North East India is – that there is so much to explore out here. Also to change the stereotypes. Many successful and influential designers – national or international, have been inspired by various cultures of India like Rajasthan, Gujarat or Banaras. I hope to put North East India on the global fashion map. You can check out more of Reena Ahanthem’s amazing work on her Instagram profile.